Unsweetened chocolate, also known as bitter or baking chocolate, begins as pure chocolate liquid. This liquid, referred to as liquor by chocolate manufacturers, is then heated and poured into molds where it cools and hardens and is primarily used for baking. Sweet chocolate is made from the same liquor but has extra sugar and cocoa butter added and can be used for baking and eating. Semisweet chocolate is also made from chocolate liquor and has some sugar added. Anytime you need to store you chocolate (to be melted later), you should keep it in a cool dark place where the temperature won't rise above 75F degrees. When chocolate is exposed to higher temperatures, it will change color and become paler as a result of the melting of the cocoa butter. But keep in mind this should not affect either the quality or the flavor of the chocolate. You want to be careful when melting chocolate because it can burn easily. The traditional method for melting chocolate is with a double boiler, but this can be risky since you are increasing the chance that the chocolate seizes as a result of coming in contact with water. I opt for either melting the chocolate directly on top of the stove or in the microwave. I like melting chocolate in the microwave since it is so quick and easy. When done properly, chocolate can be melted in the microwave more quickly than directly on the stovetop or in a double boiler, and with less effort and mess. The time required will depend on the amount and type of chocolate being melted. I usually start by placing the small pieces of chopped chocolate in a microwave safe bowl and heating for 30 seconds on 100% power. Then stir the chocolate well. If needed, microwave for additional 10 to 20 second intervals, stirring well after each interval, until the chocolate is melted and smooth. Place the small pieces of chocolate in a small, heavy-bottomed saucepan over the lowest heat possible. Stir the chocolate frequently and remove it from the heat just before it is completely melted. Continue to stir until the chocolate is melted and smooth. Just remember low and slow and you should have no problem. What To Do If My Chocolate Seizes? 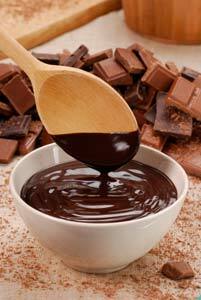 Stir 1 tablespoon of vegetable oil or shortening into every 6 ounces of chocolate and stir until smooth.